With winter slowly wrapping up in Winnipeg, it’s time to start heading outside again and enjoying Spring and Summer while they’re here! And what’s better than filling your calendar with all kinds of fun and free activities! This list is in no particular order – they’re all great, totally free (unless you buy things while you’re there of course) and spread out across Winnipeg for all to enjoy. These will take you through to the fall – perfect way to plan out your summer and keep costs down. 1 – Doors Open Winnipeg is May 30th and 31st. Totally free – get out there and check out all kinds of neat locations you’d normally not get to get access to. If you haven’t been before it’s a good idea to wear some good shoes as you might be walking around a lot, bring some water and a snack too. You can use their website to plan your weekend out, some locations are very popular so always good to plan early. 2 – Take a free guided tour of the St. Boniface Cathedrale and Cemetery. This is a great place to bring a visitor, or if you’ve never been it’s a really neat place to explore. The tours start June 14th and are every saturday at 11:30 a.m., 1:00 p.m., 2:00 p.m. and 3:00 p.m. If you’re feeling artistic bring along a sketchpad or some paints and get set up nearby. You can paint the Cathedrale, the bridge, the museum – just keep turning yourself around. There’s a lot to explore while you’re there, take a walk around and see. 3 – Free music festivals! There are so many all over the city all summer. Bring a lawnchair or a blanket and head out to enjoy all types of music. TD International Winnipeg Jazz Festival (June 11–21), the Winnipeg Fringe Theatre Festival (July 15–26) and the Manitoba Electronic Music Exhibition (August 13–16) are in full swing, head to Old Market Square for free entertainment on The Cube stage. Take in the Red River Co-Op Summer Arts and Entertainment Series at Assiniboine Park. The series includes the Summer Music Series (various evenings starting in late June), Art in the Park, and the Leo Mol Jazz Series (Sunday afternoons, late June through August). 4 – Take the Legislative Tour! From July 1st until Labour Day weekend they offer free guided tours. Learn about the history and architecture – this one is wheelchair accessible too. Great to bring visitors to, but also just for a fun outing. 5 – Check out Canada’s Royal Winnipeg Ballet’s spectacular performances July 29-31 at the Lyric Theatre in Assiniboine Park. Makes for a fun evening out! 6 – Movies in the Park! Every friday night in August there are some great movies playing at the Lyric Theatre in Assiniboine Park. The earlier one is a cartoon or family movie and usually the later one is a teen or grown up movie. Pack up some blankets or lawn chairs and head out early to stake out a good spot. Bring some bug spray or wear long sleeves, and the blankets are good since it always gets pretty cool in the evening and helps protect you from bugs too. Bring a picnic or some snacks and it’s a great evening out! Great lineup this year! 7 – Have a fun free day out – head out to one of the free pools or splash pads. Pack a picnic and enjoy the water, and local parks. Always fun on a nice hot day and easy to spend the entire day out as there as washrooms available and usually lots of room to spread out. Head to your local one, or go check out a different one in another area of the city for something different. Makes for a fun playdate too – spread the word and meet up as a group. 8 – Another fun day out with kids is to check out our amazing parks! Check out the Variety Adventure Heritage Park at the Forks – there’s a splash pad, lots for the kids to play on and some history too. There’s a lot of room to spread out, picnic tables or bring a blanket. Lots of nice shaded areas too. Or check out the Nature Playground at Assiniboine Park. Playground for the kids, picnic shelter with fire pits – you can even reserve a spot and head out as a group. 9 – Check out a Farmer’s Market – most are free to get in and there’s always entertainment and things to see. It’s a great way to meet vendors, neighbours and get a real sense of community. What you buy won’t be free, but it’ll be local which is always great! There’s an amazing amount of Farmer’s Markets in the city now – different days and areas so easy to find one that fits. 10 – Manyfest is a really fun street fair and it’s on September 11th to 13th this year. There’s an outdoor movie, farmers market, food truck wars, lots of special events for the kids and the entire family. For the grownups there’s a wine and beer garden too. We always look forward to this one as it’s always right around back to school. 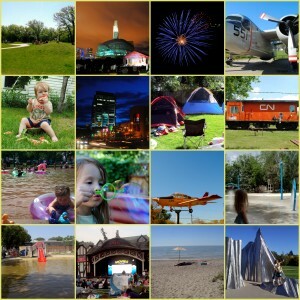 What are you planning for your summer in Winnipeg? Any other fun free favourites that I missed? Which one of these are you most looking forward to? Thanks to Tourism Winnipeg for some great suggestions and to Angelle Holmes for the amazing picture – it just screams Winnipeg Summer Fun! « Sneak Peek at Checkout51! Another great one for the lust is the Mint. The Tours cost, but if you ok with walking through yourself it’s FREE. There are a few interactive displays in the gift shop too. For $3 you can press your own coin.